I recomend wine. :o) You are going to need it. I agree with the person (people?) who said that if it's old wallpaper it'll be easy. Forget the power sprayer and use a sponge (large and natural would be nice), just be patient and give it plenty of time to soak in (1/2 hour?) and be ready to re-sponge as necessary. You'll also need the sponge to clean any remaining paste off. I think we used hot water and ammonia to get the stuff in your room @ 1604 off & it wasn't bad at all. I like the rubber scraper idea. I have no opinion on newer or (shudder) vinyl paper. Seems like skim-coating w/ plaster would be $$$$$. Sorry the floors didn't turn out! We have done this. All of it. Except simply skimming over--doesn't that loosen the paper unless you use an oil base first? Sometimes at the end you just have bare plaster, no finish coat underneath, which is annoying. We used an oil based primer on one room of wallpaper in Krak II (scraping loose stuff off first) patched the bad spots leftover, sanded, and painted. Looks good. It was a lotta work. We used 1/4" drywall on the other rooms, from Westover Building Supply. They are also handy with plaster advice. You aren't getting rid of the hallway medallion wallpaper, are you??? C'mon. It looks fab from here. If you are removing wallpaper that has not been painted over, then the vinegar and warm water solution will work very well. Remember to protect your floors. If the wallpaper has been painted in some places, you will need a steamer and a lot more elbow grease. 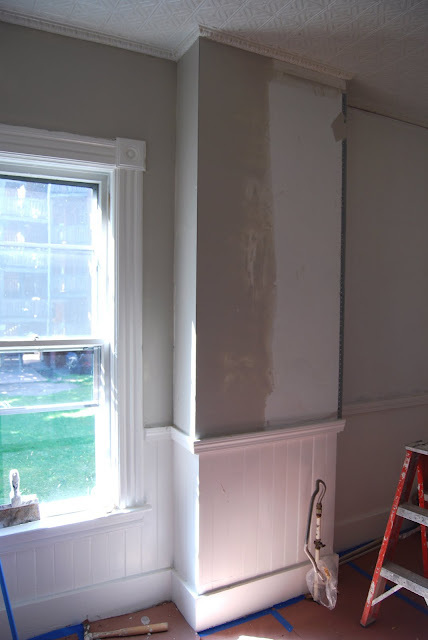 My row house walls are horsehair plaster, and I was surpised at how dark and uneven they were when the paper was removed. We filled in cracks and holes, Kilzed stains, did a skim coat of primer, and then two coats of eggshell texture paint. The walls now appear to have a smooth, even texture. Wallpaper removal is a messy job, and your fingertips will prune, but it's very do-able. Thank you all SO MUCH fo your suggestions! product is completely bio-degradable and environmentally safe. http://ezoffplus.net/ It works well if it is hard to pull off the vinyl layer, you don't score the paper it soaks thru vinyl, it works awsome the best of the best, end of story. I had some circa 1960s wallpaper that came off easily - but the glue it left underneath, not so much. After spending much time scrubbing, I decided that I would skim coat the rest. If your walls are really flat, skim coating might be a good idea. However, ours are not, so it was very difficult to get the plaster to look good - what should have been a coat or two turned into many coats. I think I ended up spending about as much time on the skimcoating as I would have spent scrubbing off the glue. Further, the areas that I just scrubbed all the glue off look a little bit better. can i skimcoat over walls that were papered and painted looks like about 2 layers of paper and 2 coats of pait? Last poster? Unless the paint used was oil-based, I am going to say no. But I am NOT AN EXPERT! Call in your local skim-coater and see what they say about preparing the surface. They need something to adhere the skimcoat to, and I'm not sure your current situation will work.